Most of us in Florida are so used to the ubiquity of parking lots that we hardly notice their intrusion on the natural environment anymore. Some would say we take parking lots for granted, accepting their lack of attractiveness as a fact of modern life. Reports do suggest, however, that blatantly unattractive or neglected parking lots can turn people away in a matter of seconds. Cracks, stains, faded stripes, and poor lighting in your parking lot are among the many problems that can drive customers, owners, or prospective tenants away in a matter of seconds. To avoid this situation, we suggest taking a few steps to ensure your parking lot is attractive and safe. First, plan your parking lot for the people who will be using it. Then maintain it to keep it in top-notch shape. When planning your parking lot or parking lot redesign, it's important to keep the people who will be using the space in mind. What is going to be safe, functional and appealing to them? The success of your venture depends on your thinking carefully about these elements, not just about fitting vehicles on your lot. After all, the parking lot is the first and last thing people experience when visiting your business/building. To create a positive impression, contractors suggest considering size, location, design of the surrounding buildings, and surrounding environment. Your parking lot should not be biggie-sized or obtrusive, but rather, it should fit in with the buildings nearby. It should be properly lit to avoid dangerous situations at night; have highly visible stripes for safe parking and traffic flow; and have pavement that can be easily maintained to avoid unsightly stains and dangerous cracks. Asphalt is your best choice for parking lot pavement; however, even the most well-constructed asphalt parking lot will deteriorate over time in the Florida sun. Rain, spills and traffic will also damage your asphalt pavement, eventually leading to stains, cracks and depressions in the surface of the parking lot. If not addressed early in the deterioration process, minor issues with your pavement can become expensive, major problems. 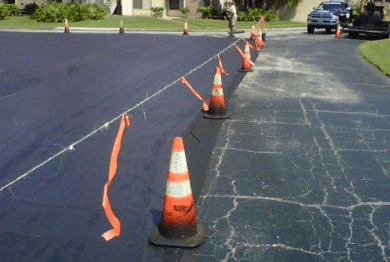 The best way to avoid having an unsafe, unsightly parking lot that requires expensive repairs.is to maintain your asphalt with regular, high quality Florida sealcoating. Sealcoating will keep your parking lot looking its best while protecting your investment in your pavement. To maintain your Florida parking lot and protect your investment, call Liberty Sealcoating at 1.888.957.2836 or contact us online. We have over 25 years of experience paving and protecting parking lots in Central Florida.